The struggling bats of the Boston Red Sox lineup woke up in the rubber match against the defending World Series Champions Chicago Cubs. Kris Bryant hit a 422-foot moonshot over the Green Monster in his first at-bat at Fenway Park giving the Sox an early 1-0 deficit. This lead may have seemed like a crooked 7 considering the offensive performance against the New York Yankees. The young, stud Andrew Benintendi was the energy spark the Sox needed as he responded with a homer of his own to knot the first game up. The Sox didn’t look back from there, putting across 5 runs in the first inning against the Cub’s ace, Jake Arrieta, set the tone for the rest of the series. The five run first was enough for starter, Drew Pomeranz, as he threw 6 innings with 7 strikeouts only allowing two earned runs due to the long-ball. Besides the two mistake pitches to Bryant in the first and Albert Almona Jr. in the 3rd, Pomeranz was effectively dropping his nasty, knuckle-curve in for a strike. The Sox dropped the second game of the set 7-4 after Steven Wright gave up a dinger to right-center field to catcher Miguel Montero giving the Cubs momentum as they tie the game up at 4. Montero is off to a hot start at the plate(.394/.429/.606) in this 2017 season. In final game of the set, the Sox offense supplied early run support with a two-run blast by Hanley Ramirez. 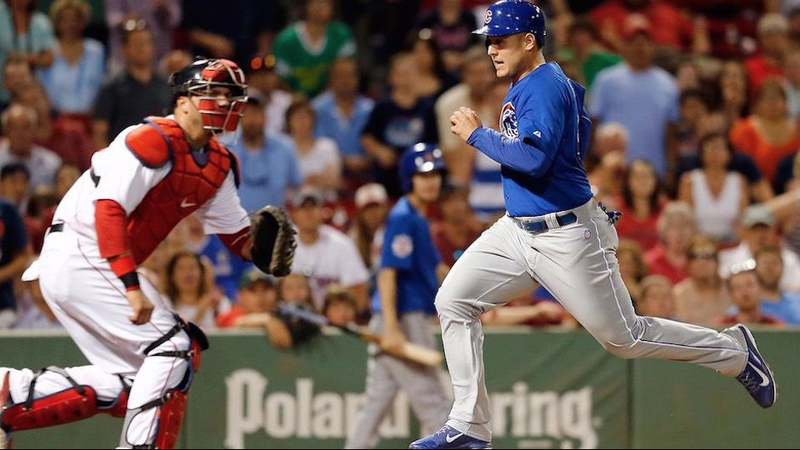 The Cubs knotted the game up in the top of the 7th after a Joe Kelley wild pitch allowing Jon Jay to score. The initial call of home-plate umpire, Bruce Dreckman, was ruled out, but Jay immediately signaled to head coach Joe Madden to check the review. The Sox remained composed despite the defensive fluster, catching a break in the bottom of the 8th when Marco Hernandez slides into home after a wild pitch by Pedro Strop. Scoring another 3 runs in the inning, the Sox hold on to win the game with a score of 6-2. There are plenty of positives to take out of the series on the offensive side. The emergence of the long-ball with two round-trips each by Benintendi and Ramirez. Along with the return of Dustin Pedrioa, reestablishing himself in the 6th hole by going 6-10 in the 3 game stretch. The Sox hope to carry the offensive momentum in the four game series of against the Baltimore Orioles.